A well balanced diet is critical for good oral health. Foods that are high in sugar or starch (soft drinks, cookies, cakes, pastries, potato chips etc) react with bacteria on the teeth to produce acids that affect tooth enamel. On the other hand, crunchy raw vegetables and fruits low in fermentable carbohydrates help exercise the gums and assist in flushing food particles out of the mouth. Some foods such as cheese, popcorn, nuts and vegetables are considered beneficial owing to their nutrient content, or they may inhibit the plaque formation. 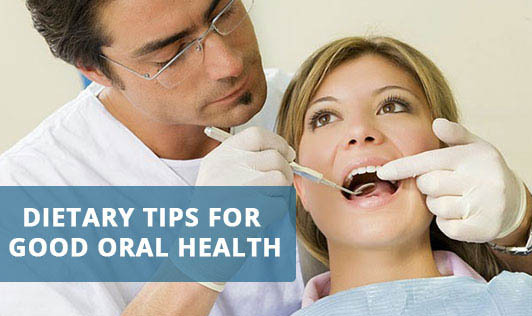 Other healthy practices include drinking plenty of water, avoid sipping carbonated beverages or harboring candy/sugared breath mints over extended periods, avoid snacking frequently and undergoing regular dental check ups.